Is the opportunity for Distributed Energy Resources (DER) in the Commercial & Industrial customer segment real? Next generation DER has the potential to reshape energy usage and create substantial value in the C&I segment. Progress on costs and appropriate business models is promising. Barring surprises, we expect to see the segment take-off over the coming two to four years. PV economics have improved rapidly, driving robust growth in PV penetration levels. Setting aside the potentially severe impacts of the imposition of steep tariffs on PV imports, we anticipate sustained growth. More interestingly, we see the emergence of new business models. As subsidies fall and rate structures evolve, the emphasis is on using PV as part of an integrated energy source for C&I and municipal customers. The focus is shifting from tax equity-based financing and origination (at any cost) to using PV to reduce the cost and risk of supply for C&I. Remote and virtual net metering, and more workable community solar business models are maturing rapidly. 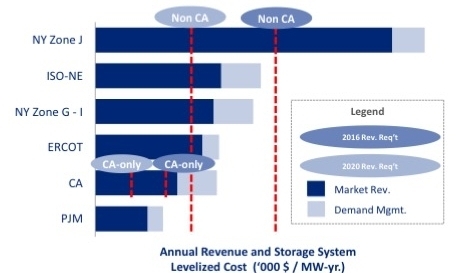 About 100 MW of BTM storage has been installed in the U.S., and most of that is in California to help C&I customers reduce demand charges on their utility bills. At current costs, storage is generally attractive to C&I customers only in locations where demand charges in C&I tariffs are relatively high (>$15/kW-mo) – and even then, substantial incentives or policy mandates are usually also required to make a storage project viable. Stacking of value streams from multiple revenue sources is essential, and in the case of PV and storage in California, potentially quite lucrative. However, storage costs are falling rapidly, around 10% per year for the next several years. Moreover, other states (e.g., Massachusetts, Maryland, Nevada) are adopting policy mandates promoting storage. Combined with business model innovation, BTM storage will become economically appealing to C&I customers in many parts of the U.S. in five years – or less. 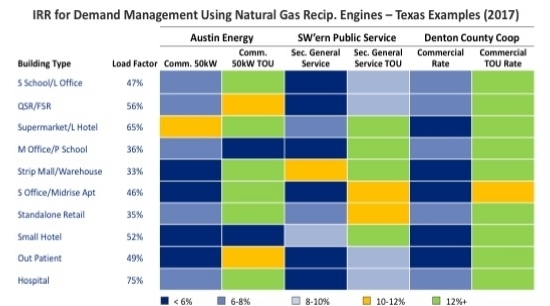 With low prices for natural gas and increasing efficiency of small-scale generation technologies, gas-fired DG is an attractive alternative to electricity in many U.S. markets, as evidenced by the emergence of specialized players such as Enchanted Rock and Tangent. As with storage, multiple value streams can be stacked to generate favorable returns for C&I customers – even in markets where PV and energy storage aren’t currently viable. 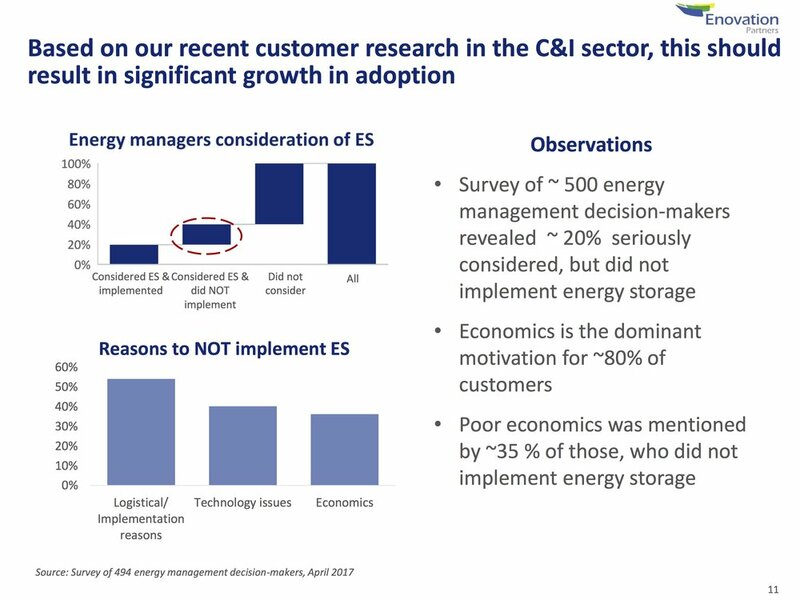 Although many C&I customers indicate interest in storage due to reliability concerns or desire to reduce environmental footprint, our research (survey of >400 customers, augmented by interviews) suggest that economic considerations far outweigh any other factor in deciding whether or not to employ DER. Customer acquisition costs are high and sales cycles are lengthy, yet margins tend to be thin – especially today since many storage providers are pricing aggressively to enter the market. Owning and maintaining the customer relationship is essential for long-term success. Advanced analytics will be a critical source for unlocking value for customers, advanced software capabilities for monitoring optimization and control of DER; and load will become “table stakes.” Moreover, since C&I customers seek a materially lower total spend on energy, vendors that can offer an technologically agnostic array of solutions – including commodity – may be preferred. Whether a C&I energy customer or a competitive or regulated supplier to the C&I market, a number of “no regrets” actions are worth beginning now in preparation for full take-off of C&I DER. Distributed Energy Resources (DER) is a primary focus area for Enovation Partners. We have served a wide spectrum of clients – including many leading competitive energy providers and utilities, equipment OEMs, C&I energy buyers, and investors. We have also built proprietary analytical tools to support marketers, sales teams, product designers, and regulatory strategists. The following is a very brief summary of our observations on this rapidly evolving sector, and practical implications for potential market participants. To learn more about our perspectives on C&I DER, please contact Dan Gabaldon.